It seems like the ideal game of chess is supposed to take hours, right? I seem to remember hearing stories of matches between grandmasters taking days. But indie game designer Bennett Foddy—best known the fun, impossible-to-play running simulator QWOP—doesn’t have time for all of that. His video game remix of the quintessential strategy game finishes matches in mere minutes. Oh, and it’s played by 8x as many people as a ‘normal’ game of chess. Unveiled at New York University’s annual No Quarter exhibition, Bennett Foddy’s Speed Chess reminds you that chess is supposed to be a military battle and, yes, military battles are filled with screaming and confusion. Sometimes, you don’t know how you won. 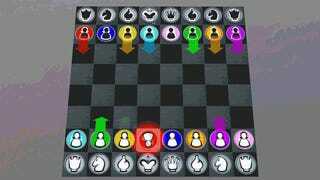 The video above shows the game in action and has Foddy explaining why he thinks that getting 16 people to play a game of chess is a good idea. An extra bonus: look closely and you'll see a new version of Mark Essen's cult favorite Nidhogg.